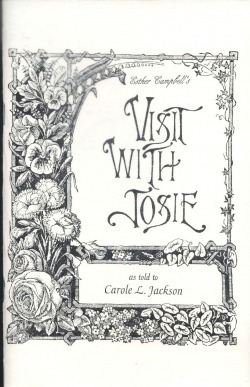 Esther Campbell, an eminent one-room school teacher in Western Colorado was a friend to Josie Bassett Morris. These are her recollections of Josie. Nineteen year old Josie, married Jim McKnight in 1893. Their marriage was doomed from the start. In the fall of 1913, Josie emigrated to Utah where she married M. B. (Ben) Morris. They settled along Cub Creek near Jensen, Utah. This is Josie Bassett Morris' story. Booklet, c1992, 40 p. : ill. ; 14 cm. - Revised & in Color.